The No1 Arsenal themed football podcast, ‘Footballistically Arsenal’ now has a suite of apps to accompany it. 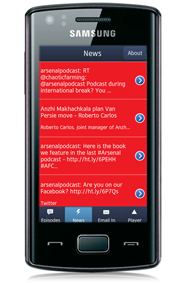 Whether you’re bada, iPhone or Android you can hear the latest podcast on the move, get up to the minute Arsenal news from the BBC, Telegraph and The Guardian, email the show directly and see what they’re tweeting about all without having to return to your PC to sync your podcast library. Footballistically Arsenal is hosted by Boyd Hilton, Dan Baldwin and Dermot O’Leary with regular guest appearances from Ben Winston, Jack Whitehall, Matt Lucas and Tom Rosenthal.